"In Paris, riding a bicycle, you overtake cars", it is an old popular French song. But it has been far away from reality as long as most of the people used to travel in Paris using car. Nowadays things are changing. Driving in Paris has become very difficult and people are using more and more alternative means of transport. This is why Velib, the new system to rent easily a bicycle for short journey, is very popular. 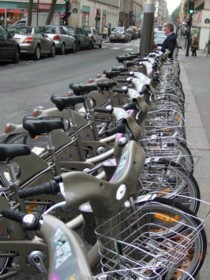 There are plenty of stations (see photo) in Paris where you can rent a bicycle for half an hour. There is no office but electronic service points where you can subscribe with your credit card (1€, 150 yens for a one day pass with which every usage lasting less than half an hour is free). You can also subscribe for a whole year (30€, 4500 yens) and then you got a RFID card and you can pick up a bicycle using only the small block where the bicycle is attached to (see photo). This card can be the same as your subway pass (called "Navigo") which turns to be a french equivalent of the Suica card. It is not a brand new experience in France. Lyon (since May 2005) and Rennes already have similar systems. But this project is the largest in France : 10 648 bicycles over 750 stations (after only few months) whereas Lyon counts 3000 bicycles over 250 stations (even after several years). The victory is also about the property system. 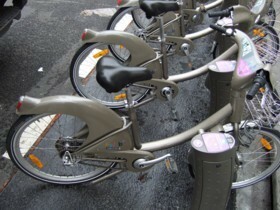 French are used to have their own car whereas Velib is more about sharing beings. After this victory the mayor, who is now on campaign for the third time in Paris, try to propose a new offer: sharing cars !